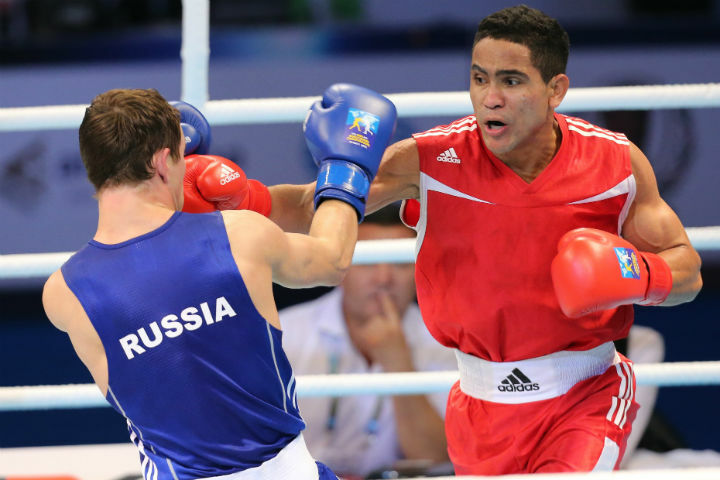 Gabriel Maestre of Venezuela slipped through to the semi-finals after a fantastic display at the AIBA World Boxing Championships Almaty 2013. He was joined by fellow Latin American David Rodriguez (Costa Rica) who made history in the process. In another blistering evening of boxing, tonight's second quarter-finals session featured the Flyweights (52kg), Lightweights (60kg), Welterweights (69kg), Light Heavyweights (81kg) and Super Heavyweights (91+kg). Flyweight Andrew Selby of Wales took on Llyas Suleimenov of Kazakhstan in the opening bout of the night. The Welsh boxer was light on his toes against the Kazakh though Suleimenov looked to be the more aggressive of the two. Selby got caught once or twice and was briefly cornered towards the end of the first round, without offering much in the way of reply, but when out in the open ground in the centre of the ring, he was able to mix it well. The Welshman had to trade punches more in the second round but the Kazak boxer looked very strong. Still Selby looked better in the exchanges in this round. The Kazakh boxer looked very sharp coming up to the end of round two and landed some heavy combinations. Round three was tightly contested as well and by the end of it, it was the Kazakh who was dancing away from Selby with the Welshman the aggressor. At the end of an exceptionally close fought bout, Selby scraped through a tough match, much to the crowd's chagrin. "The crowd put me off a bit but I have to get used to that", said Selby. "I would have liked to have beaten him more clearly but I'm happy to take the win anyways". Magomed Omarov of Russia went head to head with Magomedrasul Medzhidov of Azerbaijan at Super Heavyweight. The two APB boxers moved well for such big men. They landed some heavy shots on each other in round one, but this was really just part of the feeling out process. Round two was really where the serious business began. The round opened at quite a pace with the pair battering away at each other like besiegers trying to ram their way into an enemy fortress. Predominantly working up close with hooks and overhands, the pair eventually moved through the entire boxing repertoire of techniques. Eventually though after three bruising rounds, it was the smaller Azeri boxer who came away with the victory (3:0). Dolce & Gabbana Italia Thunder Season III Lightweight Domenico Valentino fought the southpaw Elvin Isayev from Azerbaijan. The first round was very close and neither boxer took the bench in the break, preferring to stand. Both sets of coaches were franticly giving instructions in the corner in their bid to break the deadlock. The Azeri came out fast and went on the offensive, but the Italian was skilful in his counter attacks, the bout remained tight until 50 seconds remaining of the second when the Azeri scored a knockdown. In the final round, the Italian upped the tempo and went on the front foot to chase his rival down and break through to the semi-finals with a 3:0 win. The days for "upsets" is long gone in this World Championships, as to have got to the quarter-finals, you need to have shown some consistency and merited your place. Nevertheless Venezuelan Welterweight Gabriel Maestre's victory over Russia's Alexander Besputin certainly counts as one of the most unanticipated results of the evening. Although the Venezuelan came into this event as the number three seed, Besputin's performances so far had been extremely impressive, if not to say slightly frightening. Thus the Venezuelan jolted the arena into life when he knocked the Russian down one minute into the second and served up a standing eight count around 20 seconds later. The Russian was tough (as they invariably are), and recovered well to finish the round surprisingly strong. He came out like a daemon in round three, trying to make up the lost ground and was doing well until caught heavily again by the Latin American boxer with 3 seconds left in the round. Thus Maestre took the win. "The fight was really hard. My coach told me it would be tough yesterday, but he said he had confidence in me. I'm just really pleased I made it through". Brazilian Robson Conceicao was awesome in his bout against Vikash Malik representing AIBA/India at Lightweight. The Indian boxer was given a standing eight count in the first round following a lovely short uppercut, which the Brazilian was throwing liberally throughout the round. The Indian began a fight back late in the second but you felt that this was because the Brazilian was allowing it to happen and biding his time. This proved to be the case with another standing eight issued to Malik shortly after, following a series of blows to the body. The by now almost traditional standing eight was repeated in round three as the Brazilian really worked the Indian's body, to the point that the latter did well to remain upright. In the end it was a comfortable win for the Brazilian and he will be fairly fresh going into the semi-finals. "This was a really hard fight, he was very strong and I had to be very technical to make it through", said Conceicao. "Fortunately I was well prepared for this. My tactics were to throw a lot of shots and work up close and thanks to god, this paid off. Costa Rica secured its first ever medal at an Elite AIBA World Boxing Championships through David Rodriguez when he beat Korea's Inkyu Kim in today's Light Flyweight quarterfinal. Is rest day. But remember that you can continue to enjoy boxing with the finals of the SportAccord World Combat Games from St.-Petersburg.